Our last three trips to Portland have been by BoltBus, which means we can bring the cargo bike! It’s fairly easy, but the train is a bit easier–the kids have more room to walk around and it’s a train. So for mid-winter break we took the bus to the train station and traveled without bikes. In fact, no one on our train had bikes (unless they were folding bikes stored in the train cars). Regular-sized bikes hang from those six hooks, no cargo bikes allowed. Our train had power problems of unknown origin which meant we had to slow down several times and got behind schedule. Two miles from Portland’s Union Station we stopped completely. Fortunately they guessed right that it was a faulty fuel gauge so after a long wait for the fuel truck, we were finally on our way. At least we had a great view of the refueling. Eventually we got to town and walked to our downtown hotel (though catching the MAX light rail would have been easier and quicker, which we did on the way back). The following morning we took the bus to Clever Cycles for rental bikes, which came with helmets for all, locks, panniers, lights, and bells. 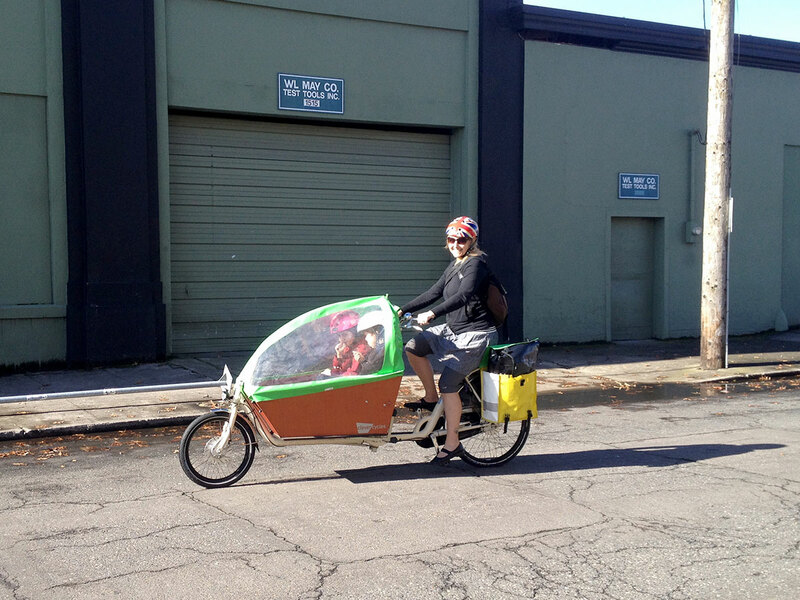 I rented a WorkCycles bakfiets with weather canopy, because I do so love renting longjohns in flatter cities (like Alternabike’s Gazelle Cabby in San Diego). Clever Cycles very generously added a Yuba Mundo longtail cargo bike to their rental fleet so Mr. Family Ride could ride a big bike, too. 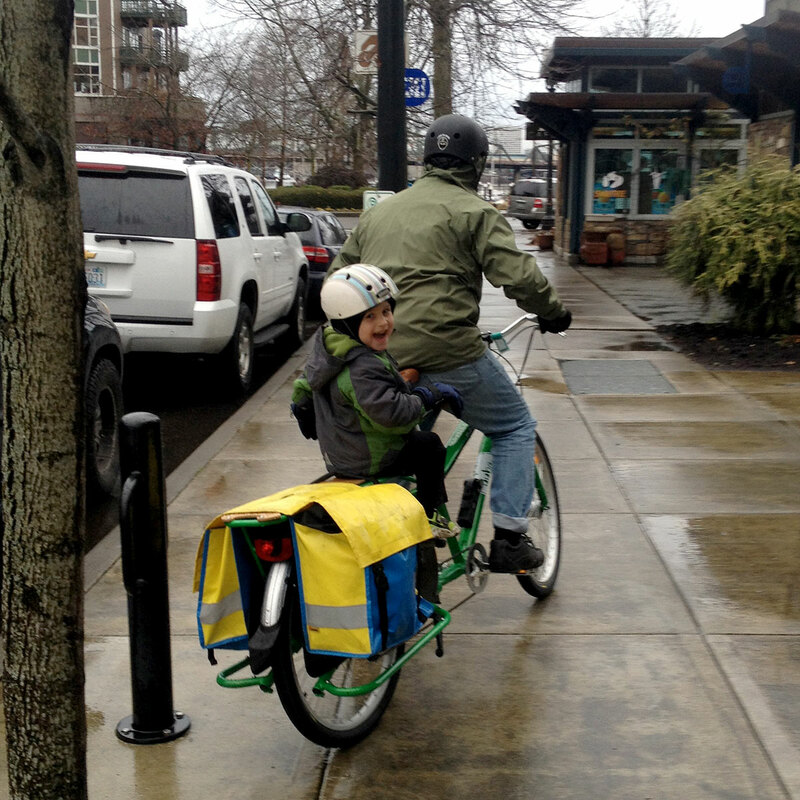 It was his first time on a cargo bike (about time!). This was also his first time on a bike with an internally geared hub…and not just any IGH, but the NuVinci N360 with Continuously Variable Planetary (CVP) transmission (it’s really really weird/cool!) so he may have been a bit distracted by the different shifting than the extra length of bike. But either way, he liked it! 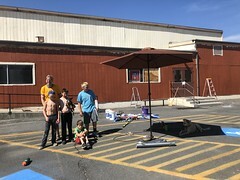 But he didn’t get to do any kid toting at first because they were both excited about sitting under the weather canopy. They mixed it up, sometimes sitting crammed side by side and sometimes with one down in the front. Martina even provided an extra seat cushion for the floor, assuming one would want to perch at the prow. 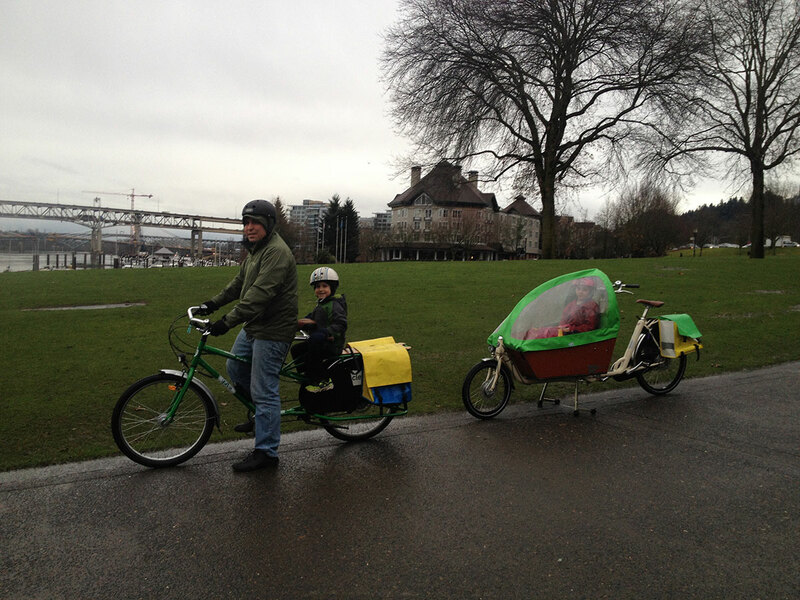 Mr. Family Ride expressed interest in trying the bakfiets, but I wouldn’t let him, assuring him he’d crash immediately. Had the weather been a bit better, I had high hopes of him conquering the linkage steering of the bakfiets and then test riding and loving a Bullitt at Splendid Cycles. I used to send him links to racing pictures from the Larry vs Harry Instagram account, thinking it’d appeal to his need for speed, but he seems set on a longtail. Apparently I’ve just made it look too fun. The kids got a little too fighty our last evening so we stuck the four-year old on the back of the Mundo and Mr. Family Ride experienced one mile of cargo biking with kid. And wow, was it nice having the kids separated while biking. We did more downtown biking than during previous visits and I properly navigated the Transit Mall (by avoiding it) thanks to correcting my mistakes of last time. 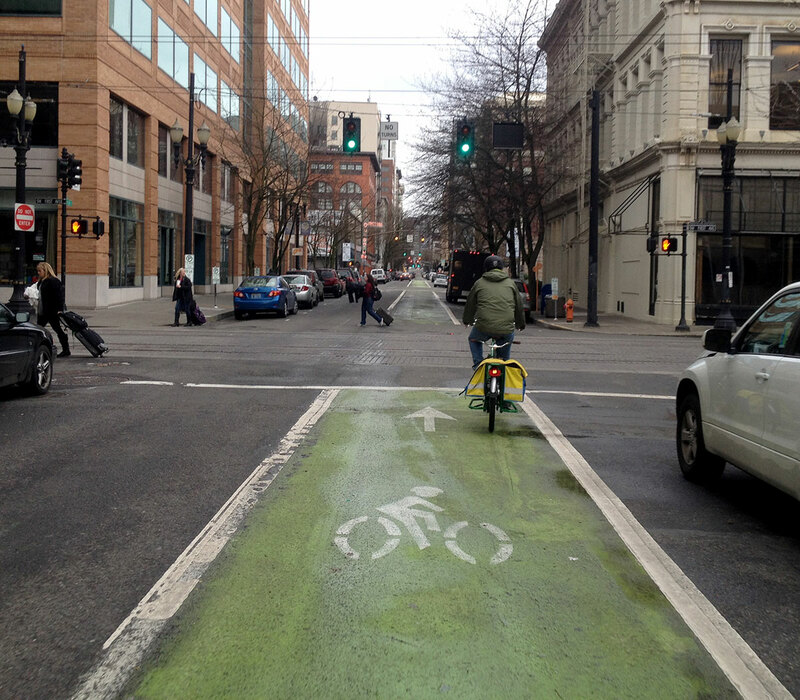 My most exciting bicycle infrastructure discovery this visit was the width of the bike lanes of SW Oak Street heading west and SW Stark Street heading east. They’re so wonderfully wide! Was it some sort of mistake? 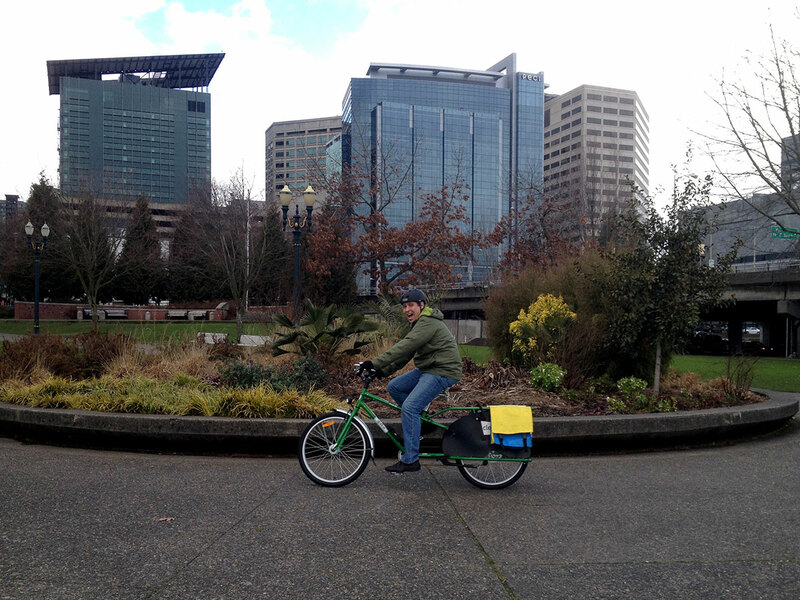 Wow, I hadn’t realized we could rent cargo bikes if we travelled to Portland. I’d love to do thst once my youngest is actually old enough to ride. I’ve rented cargo bikes in other cities, too, but Portland is probably the cargo-bike-rentiest place around :) Splinlister.com is a great resource with quite a few peer-to-peer cargo bikes available, too!